I hope that all are enjoying your family and/or friends for a great celebration of the United States of America. Our wonderful Country is having some hard times now, but there is a light at the end of the tunnel!!!! Darryl is doing well with the Chemo and we are enjoying spending time with him here, at his home, and a lot of phone conversations. We have decided that Darryl and I are two peas in a pod – we laughed about that last night on one of our 2 hour phone calls. He is an absolute Hoot! So funny and both of us are the Perfectionists and Big Worry Warts and absolutely hate taking medicine! We cherish all the minutes that we have with him! Now back to my quilting progress. This last Monday I had the feeling that this was going to be a great week and it has been. I have kept my promise of doing my 1.5 miles each morning – yes here in South Texas we get to walk even in the 90+ degree weather with about the same for humidity. Hoping that this summer brings us tons of rain. I believe that this just may be the year that we get a Hurricane in the Gulf and that it will be South of us and we will get out of this horrible drought. Terrible to have to want that…. I have now caught up with Barbara Brackman’s Threads of Memory, Pat Sloan’s Globetrotting, and so excited about Rosemary Youngs Happy Scrappy BOM! Austen Family and I are still debating what to do. That debate and struggle will start in the morning, or may be Sunday as we have company coming tomorrow. Of course all my favorite shops are having 4th of July sales – Sylvia Pippin, Hancock’s of Paducah, and Paper Pieces. They now have my money. (LOL). My creative streak has finally returned. AND, I have finally figured how to make sure a block comes out to the EXACT unfinished size! Below is a picture of the center star of Block 6 of Threads of Memory. When I cut out the star points I added 1/16″ to the cutting measurements and GUESS WHAT —— A PERFECT 6 1/2″ SQUARE STAR………….. Now it is not easy to get that measurement if you do not like math, but being the one who loves math, I finally figured out how to make a 12 1/2″ block come out square also! 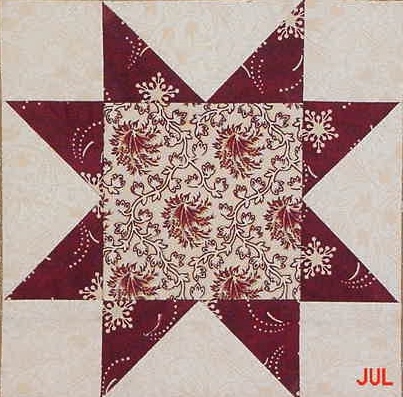 Final Block 6 – This is one of my favorites – Heck – the are all my favorites! Now on to Pat Sloan’s Globetrotting BOM. 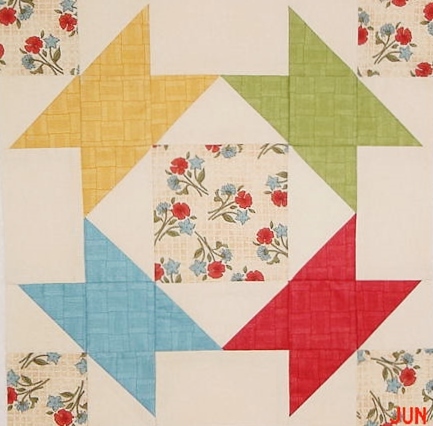 I am probably repeating myself, but Pat is one after my own quilting heart because she allows for that extra fabric when making Half Square Triangles ( HSTs!) By doing this in her directions, making her blocks are a sure thing when having the block come out to the 10 1/2″ x 10 1/2″ No time wasted here! Thx Pat! Now to Border 2. 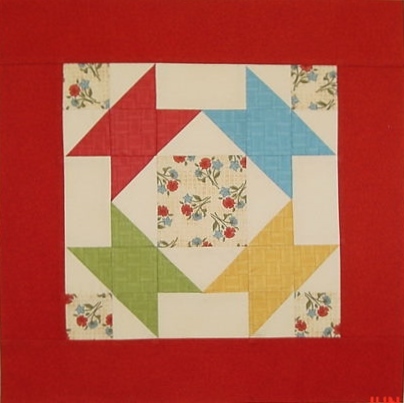 I changed my border – I turned the HSTs, in a different way that Rosemary had done hers. I am hoping this works. 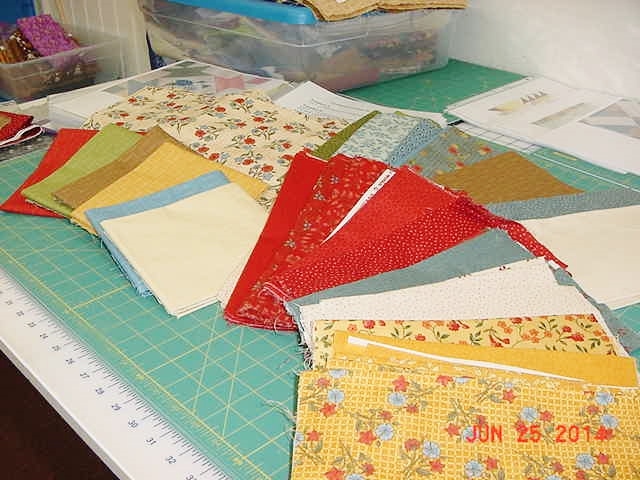 I have a great idea for Border 3, BUT I am waiting for my favorite shop – Martha’s Quilting Corner – to send me 3 scraps so I can compare (they are Crackle’s by Moda) with the fabric I am using. Keeping my fingers crossed! I am now caught up on 3 projects (at least until fabric arrives next week for Happy Scrappy). Poor Di Ford is just “hanging around” and my center medallion is still begging to be appliqued. I need to finish up on my Baltimore Applique project and get it turned in for their Auction in October. I will post more about that soon. 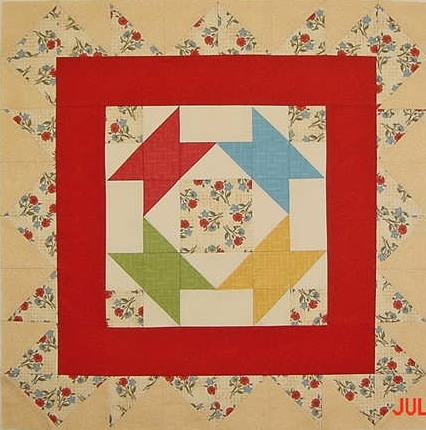 Then there is a Pam Buda project, but am thinking I might use those blocks in my Happy Scrappy quilt and kill “two birds with one stone” as they say. I am also doing some knitting and now I feel like I can start on playing with my Sashiko in the evenings. 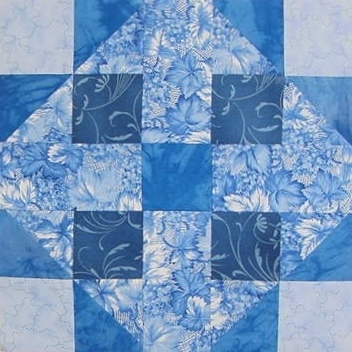 Ahhhhhhhh life is good…… Quilting is so relaxing and fulfilling. I hope that all are finding the time to enjoy your hobby. It feels good to be back in my Studio everyday – just playing. Remember – Life is Short! So much to do and so little time. Until next posting. Have a Blessed Life. 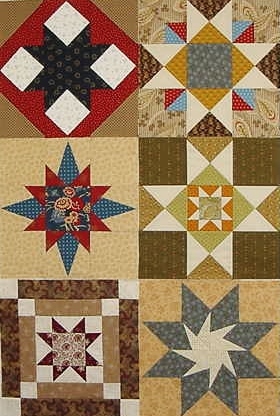 This entry was posted in Uncategorized and tagged Austen Family Quilt, Barbara Brackman, Hancock's of Paducah, Martha's Quilting Corner, Moda, Pam Buda, Paper Pieces, Rosemary Youngs, Sylvia Pippin. Bookmark the permalink. ← Up and Running Again! You have been busy as a bee. Nice blocks too. Just perfection. Life is good as long as we can do some piecing everyday.